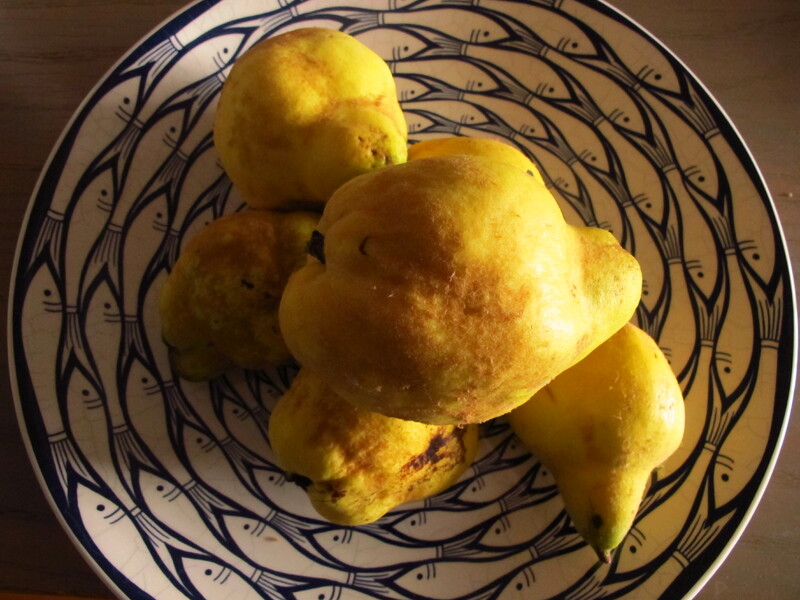 Last week, I was gifted an enormous bag of quince (quinces?). They look a bit like bulbous golden pears, sweet and juicy – but bite into them and they’re butternut-squash hard, and as bitter as a Bramley. The obvious thing would be quince cheese of course, but that would just be an excuse to buy more Picos de Europa. 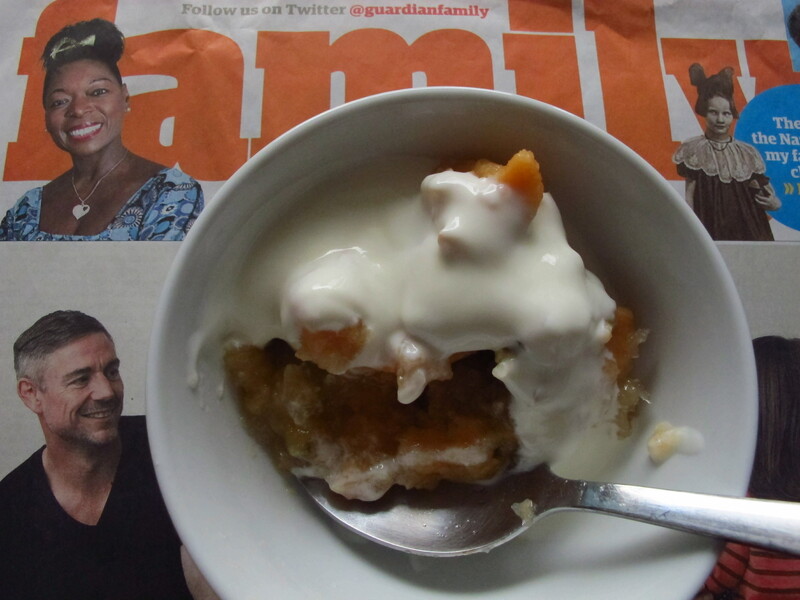 So, having consulted Nigel Slater’s Tender, I decided to make a “fragrant winter breakfast” – quince stewed with apples, lemon juice and sugar. Never one to miss the chance to set the scene, Nige describes it as one “for those winter mornings when the sky is white and a sugar-frost has caught on the spider’s webs in the garden.” It’s pretty good – slightly too sweet for my taste, and I might well substitute honey for sugar if I did it again – but much more solid than simple stewed apple, with an elusive floral flavour. The other dish, which I made to take to a dinner party on Saturday, was less successful. 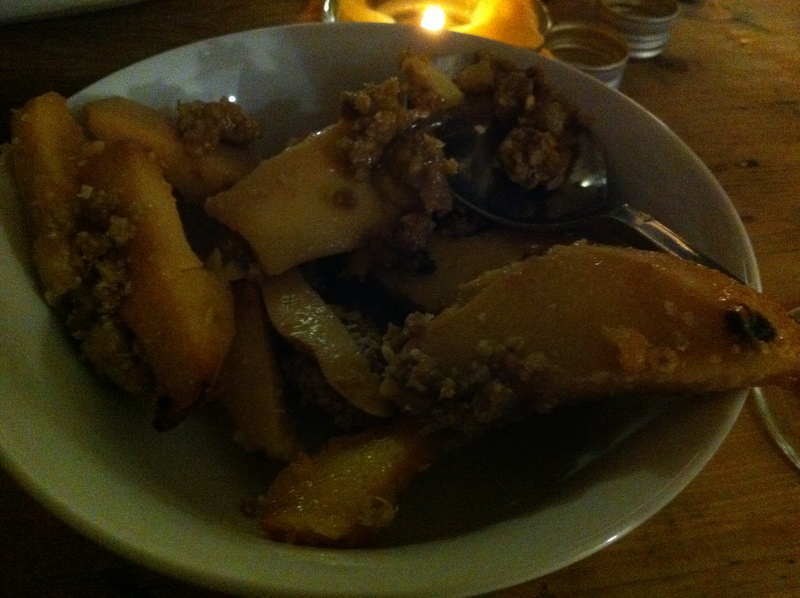 The donor of the quinces, Alex, expressed surprise at the idea of of a quince crumble, although in retrospect, the problem was less with the concept than the recipe (not the execution, obviously). The recipe, for four, called for 1.75kg of quince, which needed to be softened in butter “in a large frying pan” – I’ve got a big Le Creuset, but still, they took an awful lot longer than Nigel’s upper limit of 35 minutes to soften. Once they’d finally yielded (although, it turned out, only in places) I sprinkled on a laughably small amount of almond crumble topping, made with chestnut flour in deference to the gluten-free one, then boosted it with hazelnuts in panic it looked a bit mean – everything about this recipe, including the amount of sugar, seems designed for a much smaller amount of fruit. Everyone was very nice about it, but it’s undeniable that the quince were rather fibrous and crunchy, as well as a bit sour, and there wasn’t enough bloody crumble. And I didn’t make Bird’s custard. Still, there’s always next year. What a shame – I’m sure I saw some recently in one of the Turkish greengrocers near me (but I think I’ve had my fill for this year frankly)!